Parks and trails are an important part of any community. They provide safe healthy places to play and explore. In a well-designed community, homes, parks, stores and schools are connected by safe walking and biking routes. Safe routes encourage children and their parents to enjoy the outdoors and get physical and mental health benefits at the same time. A recently completed project in Hillsborough, NH funded by the New Hampshire Children’s Health Foundation identified walking and bicycling travel route safety gaps that should lead to improvements being made for kids to be able to walk or bike more safely to places they like to play. Over the last 50 years most community transportation infrastructure improvements have been designed to more safely accommodate cars, but often not pedestrians or bicycles. As a result, children face hazards like missing sidewalks or dangerous street crossings if they want to walk to school, the neighborhood park or playground, and their parents are concerned about their safety. Consequently, kids don’t walk or bike as much as they should. And the resulting lack of physical activity, as we know, contributes to childhood obesity, one of the top health problems in our country today. The Centers for Disease Control and Prevention recommends that children get at least 60 minutes of moderate to vigorous physical activity each day, but notes that few children meet that standard. The CDC also notes that improving access to community parks and trails encourages people to use them and that people are more likely to walk when they feel protected from traffic and other safety hazards. One of the New Hampshire Children’s Health Foundation’s five funding priorities is to reduce childhood obesity. 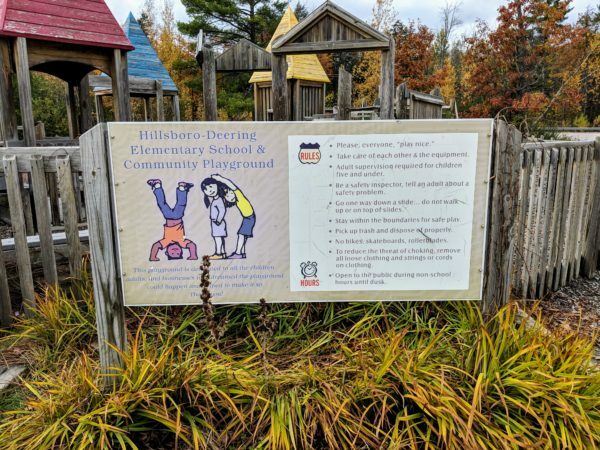 The Foundation granted $10,000 to the Central New Hampshire Regional Planning Commission to undertake a study and make recommendations to improve safety and accessibility for children to get to Hillsborough’s parks and playgrounds. The nonprofit Planning Commission provides communities with professional assistance with environmental, land use, transportation and regional planning issues. Hillsborough is a community of 6,000 in central New Hampshire. Its K-8 student population numbers about 900. It’s a traditional, gritty New England town built around old brick water-powered factories and sprawling former agricultural countryside, now modernized by retail strip development along its two-lane highway access. The idea for Hillsborough’s Safe Routes to Play evaluation was triggered by the town’s master planning process, according to Planning Commission staff member Craig Tufts who led the project. 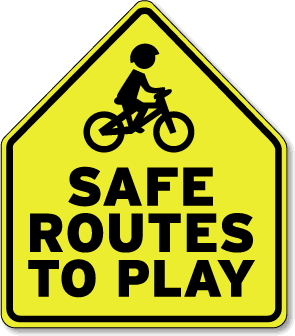 Safe Routes to Play, he says, is modeled after the popular Safe Routes to Schools initiative. One of Hillsborough’s strengths is in the potential walkability of its downtown village district, Tufts notes. But the main corridor through the village was built to handle a high volume of through traffic on its Main Street which once doubled as NH Routes 202 and 9. A highway bypass around the village was constructed by the State a number of years ago, but the village wasn’t subsequently redesigned as a pedestrian destination. A streetscape improvement project and the implementation of a Safe Routes to School project changed that, Tufts said. With the help of the local school district and the town, Tufts and his team began their Safe Routes to Play evaluation by surveying parents, teachers and other community leaders to identify spots in town where kids play. These include a beach at Emerald Lake, Fox State Forest, the Hillsborough-Deering Recreational Rail Trail, parks, playing fields and the town library. They discovered that Hillsborough kids most frequently walk or bike through their neighborhoods to get to friend’s homes, or from their school to parks and playgrounds. Kids use the formal streetscape, but also traverse informal paths and cut through parking lots. 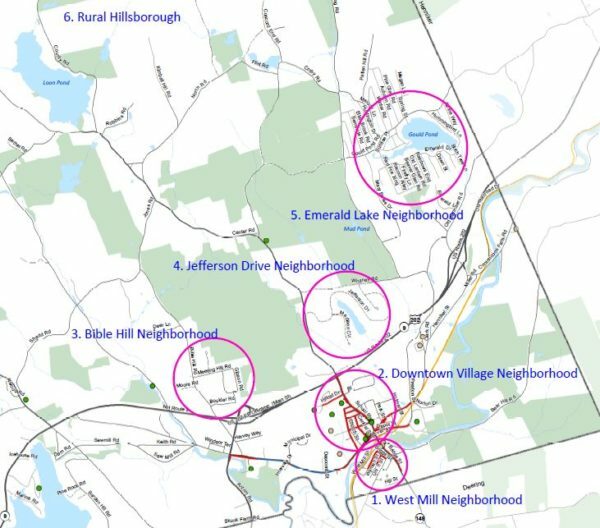 Through the public participation process, Tufts’ team identified six areas — including the downtown village, several residential neighborhoods near downtown, and “rural Hillsborough” — that were important recreation assets for kids. “What we wanted to learn first was where kids were going – and where they’d like to go,” Tufts says. Then by conducting walking tours and detailed site evaluations of those areas, the team came up with a plan and recommendations to give Hillsborough kids safer ways to get to them. Tufts team, with engineering assistance from KV Partners, evaluated the availability of sidewalks (much safer for pedestrians in high traffic areas than walking on the side of a street or roadway), crosswalks and street crossings that currently pose hazards for pedestrians, particularly young children. As an example, Tufts mentions that an intersection designed solely for cars might have wide sweeping turns, but it’s much safer for pedestrians to cross intersections with shorter distances and tight angles that encourage cars to slow down — particularly if the intersection is in a natural route between an elementary school and a popular community playground. Making intermittent sidewalks contiguous, adding granite curbing to existing sidewalks to prevent cars from inadvertently driving onto them, creating separate parking and walking access to public playgrounds, and adding lane striping or signing to roadways to decrease traffic speeds are among the recommendations the Safe Routes to Play evaluation makes for the six selected areas in Hillsborough. “It’s a lot of little bits and pieces that cumulatively add up to changing the experience,” Tufts says. Kids are getting outside less. Fewer walk to school. In the project’s public participation process Tufts heard from adults who were nostalgic about how they were more free to move around Hillsborough when they were children than kids seem to be today. The Hillsborough Safe Routes to Play evaluation comprises a detailed project description, photographs, maps and engineering drawings that outline specific recommendations for improving pedestrian and bicycle safety in the six areas the project focused on. Tufts does not expect all recommendations to be implemented, but anticipates that having thoroughly researched and documented the need for safety improvements, that the town will be aware of them and that they’ll be incorporated into ongoing transportation improvements. In addition, Hillsborough may be able to win federal funding to support some of recommendations given the quality of the work that the evaluation represents. Tufts noted that while it is not a part of the Safe Routes to Play project, Hillsborough recently won $530,000 in highly competitive Transportation Alternatives Program funding from the NH Department of Transportation and the federal government. Funds will be used to construct nearly a mile of new sidewalk adjacent to West Main Street (which doubles as State Route 149) from the downtown village area to Shaws supermarket. According to Patti Baum, the New Hampshire Children’s Health Foundation has funded similar projects in Manchester, the Nashua region and in Hebron, NH. “An important aspect of our preventing childhood obesity funding priority is providing support for activities to establish local policies and practices to promote active living for children and their families. This type of work is a solid example of that,” notes Baum. “Our grants are often relatively small, but it’s not uncommon for them to leverage much bigger returns over time because their focus is so important,” she says.